Swags Galore is excited to announce that we have acquired a new line of kitchen curtains! The Ribcord Curtains is a separates series. Valances, Swags, 24� and 36� tiers available in 8 great fashionable colors, Blue, Blush, Buttercream, Evergreen, Navy, Sage, White, and Wine. These solid color Kitchen Curtain are made with a semi-sheer opaque fabric, and feature a vertical ribbing that add an elegant design while maintaining the solid color look. 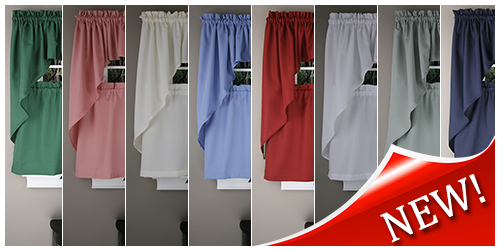 Ribcord curtains will fit into any home�s kitchen as well as most other windows in the home. Large and small windows alike, the Ribcord will compliment most any room with its many solid colors options. Making it easy to match any home d�cor. Feel free to mix and match different pieces and colors to accommodate any look you are going for! If it's a Window Top Treatment your looking for consider using the insert Valance as a Tailored Valance along the tops of your windows or if it's a more fashionable look you searching for consider using a Swag Pair with an Insert Valance. If your looking to dress a wider window you can use as many insert Valances as needed to cover the area. The rule of thumb is to use a minimum of twice as much fabric for the window you're covering. For instance if your window is 120� wide, you would need approximately 240� of fabric to cover it. So if the Swag pair is 54� wide and the Valances are 54� wide you would need 1 swag pair, and 4 valances, giving you a total of 270� of fabric, leaving the window treatment looking full, rich and properly dressed. Using less fabric will make the treatments look stretched and cheap not meeting your expectations. Swags Galore has Plenty more kitchen curtain options to choose from such as our lace kitchen curtains and complete kitchen curtain sets. We encourage you to stop by and check them out today�.... all our inventory is on Sale! We offer many coupon codes to help with your shopping experience. FREESHIP75 for free shipping on orders over $75, SAVE5 to save 5% on entire purchase or SAVE15 to save 15% on orders over $100! Unfortunately coupons cannot be combined, you can only use one coupon per order, click here for more details!